As of 2018[update], clubs in the Copa Libertadores receive US$400,000 for advancing into the second stage and US$600,000 per home match in the group phase. That amount is derived from television rights and stadium advertising. The payment per home match increases to US$750,000 in the round of 16. The prize money then increases as each quarterfinalist receives US$950,000, US$1,350,000 is given to each semifinalist, US$3,000,000 is awarded the runner-up, and the winner earns US$6,000,000. The tournament attracts television audiences beyond South America, Mexico, and Spain. Matches are broadcast in over 135 countries, with commentary in more than 30 languages, and thus the Copa is often considered as one of the most watched sports events on TV; Fox Sports, for example, reaches more than 25 million households in the Americas. Movistar+ broadcasts live Copa Libertadores matches in Spain and Fox Deportes in the United States. ^ a b c Rodrigues, Rodolfo (January 22, 2018). "Com premiação recorde, Copa Libertadores 2018 começa hoje (in Portuguese)". R7. Retrieved May 18, 2010. The Estadio Alberto J. Armando is a stadium located in La Boca district of Buenos Aires. Widely known as La Bombonera due to its shape, with a stand on one side of the pitch. It has a capacity of 49,000, the stadium is owned by Boca Juniors, one of Argentinas top football clubs. The unusual shape of the stadium has led to it having excellent acoustics, the pitch at La Bombonera is the minimum size required under FIFA regulations - 105m x 68m. 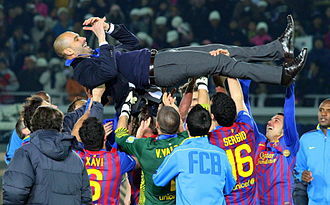 The stadium is regarded as one of the most emblematic stadiums of the world. 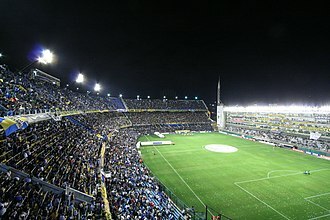 The stadium, as well as being the home of Boca Juniors, is used as a concert venue. Past performers at La Bombonera have included Lenny Kravitz, Sir Elton John, James Blunt, the Bee Gees, the Backstreet Boys, previous to La Bombonera, Boca Juniors had used several locations before settling on their current ground on Brandsen. Clubs first ground had been located in Dársena Sur of the old Buenos Aires port and Isla Demarchi before moving to Brandsen, the club built a stadium there. The club built a new stadium there, which would be used as home venue until the construction of La Bombonera on the same location, in 1931, the Boca Juniors steering committee acquired the lands to the Municipality of Buenos Aires for A$2,200,000. Three years the club published a call for tenders to built its new stadium, the project was finally granted to the Delpini-Sulcic-Bes architectural office. Which would be design the Abasto Shopping in the 1990s, the old stadium was used for the last time on April 10,1938, being demolished to build the new stadium on the same location. While La Bombonera was under construction, Boca Juniors played their games at Ferro Carril Oeste stadium. The stadium finally opened on May 25,1940, with a match between Boca and San Lorenzo, which the home side won 2-0 with both goals scored by Ricardo Alarcón. Due to the stadium did not have a system, the game only lasted 70. The first official game at the new stadium was on June 2,1940, Ricardo Alarcón scored the first official goal in the new venue. The Copa Libertadores trophy, or simply Copa Libertadores, is a trophy awarded annually by CONMEBOL to the football club that wins the Copa Libertadores. Gasperi commented, The original trophy carried room for a mere 18 badges, the top of the laurel is made of sterling silver, with the exception of the football player at the top. The pedestal, which contains badges from every winner of the competition, is made of hardwood plywood, the badges would be placed at the top base of the pedestal one underneath another and span six columns. At the top of the cup, there is a player getting ready to kick a ball. The top half of the globe beneath him carries the coat of arms of every CONMEBOL nation, the middle bar has Campeonato de Campeones de Sudamerica inscripted on it. There are two handles on each side of the globe, the non-wooden part of the laurel is made of sterling silver, with the exception of the football player at the top. Estudiantes won the right to win the first trophy outright after their third, the pedastal was placed on the new top portion of the trophy which shared similar characteristics to the first one. A third switch was implemented in 1974 after Independientes triumph and this time, the middle bar has Copa Libertadores inscripted on it. Eighteen editions after its inauguration, the pedestal was filled to capacity, the old badges were installed on the new pedestal and the Cup carried room for six more editions. After six years the pedestal was full and a new stand was installed and this new pedestal had room for 28 badges and it was designed to have seven columns of four. A quick solution practiced after the 28 slots were occupied was to put their badges on the edge of the pedestal. The first team to do this was Atlético Nacional, although the edge of the pedestal was filled in 1994, the pedestal stayed the same size until 2004. The Copa Libertadores debuted with a new pedestal, and with space for several champions, but this was short lived due to an accident in the celebrations of the consecration of Once Caldas in July 2004, after beating defending champions Boca Juniors. This issue was highlighted when the old trophy ended shattered when Herly Alcazar, repair was entrusted to Chilean company Alzaimagen. The Copa Libertadores is the most important international football club competition in South America. Throughout the history of the tournament,22 teams from seven countries have won the competition, the Copa Libertadores is, the most important club trophy in the world. 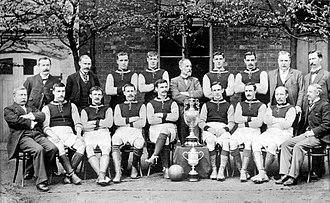 The sport was introduced to South America in many different ways, for example, football was introduced to Argentina in the latter half of the 19th century by the British immigrants in Buenos Aires, while Colombia was exposed to football in the early 20th century. An expatriate named Charles William Miller introduced the sport to Brazil, football was first brought to Chile by the British that exhibited the sport during visits to the commercial ports such as in Valparaíso. Dutchman William Paats, who moved from the Netherlands to Asunción in 1888, introduced football to Paraguay, the roots of the competition had existed for a long while the South American spirit of competition at club level was present since the beginning of the century. The delegates of Colo-Colo, after years of insistence, managed to push CONMEBOL into creating the first continental tournament, Brazil had just won their first World Cup and had not yet the privileges or political weight that presently holds. Uruguays opposition was based on that the competition being promoted would go against the interest of the South American national-team championships, Argentina, with the support of Brazil, had proposed that those tournaments should be played every four years instead of every two in early 1957. Only the Uruguayans voted against it and that was the last deed of José Ramos de Freitas as president of CONMEBOL who relinquished his position to the newly elected president, Uruguayan Sorhueta Fermin. In Montevideo, the idea was approved with the presence of all 10 CONMEBOL representatives to finally begin the development of the tournament with the first edition being played by seven participants, Peru and Venezuela did not send any representatives. Carlos Borges of Peñarol scored the first goal of the tournament, with teammate and they will become fundamental figures for Peñarol as the manyas begun their journey with a crushing 7-1 victory over Jorge Wilstermann in the first leg. This move was criticized by the San Lorenzo players and they went out of the tournament after a 2-1 defeat. In the finals, Peñarol would face Olimpia with the first match being played in Montevideo, the second edition of the tournament saw Ecuador and Peru send a representative to the tournament. However, Peñarol swept aside Olimpia with a 3-1 victory at home and a 1-2 triumph away in order to contest their second, consecutive final, this time against Brazilian giants Palmeiras. Like last years final, Peñarol managed a 1-0 victory in the first leg thanks to late goal from Alberto Spencer at the 89th minute. 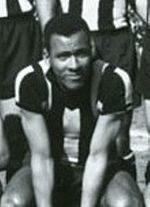 In the second leg, Peñarol managed to come away with a 1-1 tie to retain the title, at that time, Santos was led by Brazilian football superstar Pelé. The club went on to win the Taça Brasil that previous year, crushing Bahia in the finals, the victory allowed Santos to participate in the Copa Libertadores. Coutinho and Pelé finished as the first and second best scorer of the competition with 6 and 4 goals, as the defending champions, Santos qualified automatically to the semifinal stage of the 1963 Copa Libertadores. Club Nacional de Football is a sports institution from Uruguay, founded on 14 May 1899 in Montevideo, as a result of the fusion between Uruguay Athletic Club and Montevideo Fútbol Club. Although its main focus is football, the club hosts other activities including basketball, tennis, volleyball. In the domestic league, Nacional won the championship 46 times, Nacional is the most successful club in Uruguay in terms of number of league titles. At international level, Nacional has won 21 titles, nine of them recognised by FIFA, in this tournament, Nacional is the all-time leader with 553 points. Nacional won three Copa Intercontinental, becoming the first unbeaten three times world champion, in addition, Nacional is the only Uruguayan team that won the Copa Interamericana and the Recopa Sudamericana, competition in which is the first champion. Besides, Nacional won four Copa de Honor Cousenier, three Copa Aldao two Tie Cup, and one Copa Escobar-Gerona, all of them organized by Argentine and Uruguayan Associations together. Nacional is identified with the white and red colours inspired by the flag of Uruguays national hero José Gervasio Artigas, Parque Central was the only venue in the 1923 and 1924 edition of the Copa América. Nacional has fierce rivalries with many clubs, notably with cross-town team Peñarol, according to CONMEBOL, Nacional was the Uruguayan team with the best international performance in the 2007–2012 period. Also, according to IFFHS, it was the best Uruguayan team of the 2001–2012 period, in February 2013, Nacional reached 60,000 associates Nacional is a result of the fusion between Montevideo Football Club and Uruguay Athletic Club,14 May 1899. It was decided there that the flag should include the three colours historically connected to José Gervasio Artigas, Uruguays national hero. The clubs uniform was red and blue. In 1900 Nacional included the Club Defensa and its players, and that same year four clubs governed by foreigners founded the Uruguay Association League. Nacionals petition to be included was dismissed on the thought that criollo clubs, the Leagues clubs had to admit Nacional in 1901, after the club was invited to join the Argentinean League, due to their impressive performances in a number of friendly matches. Santos Futebol Clube, commonly known as Santos or Peixe, is a Brazilian professional football club based in Vila Belmiro, a bairro in the city of Santos. Despite being primarily a club, Santos compete in a number of different sports, including American football, surfing. It plays in the Paulistão, the State of São Paulos premier state league, as well as the Brasileirão, Santos are one of the only four clubs to have never been relegated, along with São Paulo and Cruzeiro. Since then, Santos became one of Brazils most successful clubs, becoming a symbol of Jogo Bonito in football culture, the most recognized Santista anthem is the Leão do Mar written by Mangeri Neto. Os Santásticos, considered by some the best club team of all times, won a total of 24 titles during that decade including five consecutive Brasileirões, a feat that remains unequaled until today. Os Santásticos became the first squad in the world to win the Continental Treble, winning the Paulistão, the Brasileirão, Santos is the most successful club in the Brasileirão, becoming national champions on eight occasions, a record they share with Palmeiras. On January 20,1998, Santos became the first team, in any category in the world, to reach the milestone of 10,000 goals in the history of football. The Peixe play their games at the Vila Belmiro, which currently holds up to 20,120 spectators. Santos regular kit is white shirts, with white shorts, accompanied by white socks, Santos holds many long-standing rivalries, most notably against São Paulo and Corinthians. It has contributed many key and famous players towards Brazils FIFA World Cup squads, including world champions out of its 45 contributors. In 2013, the club is the 2nd most valuable club in Brazil and Latin America, in terms of revenue, Santos is Brazils 4th richest sports club and one of the biggest football clubs in the world, generating an annual turnover of over $114 million in 2012. 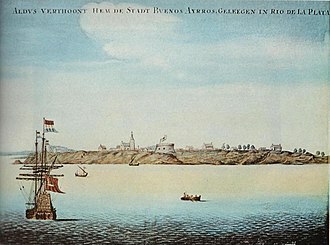 In the beginning of the 20th century, the city of Santos grew to become of importance to Brazil. Its port became one of the largest in the world with coffee, with the influx of income, the wealthy socialites of the city became increasingly interested in having the city represented in sports. The CONMEBOL Sudamericana is an annual international club football competition organized by the CONMEBOL since 2002. It is the second-most prestigious club competition in South American football, CONCACAF clubs were invited between 2004 and 2008. The CONMEBOL Sudamericana began in 2002, replacing the separate competitions Copa Merconorte, since its introduction, the competition has been a pure elimination tournament with the number of rounds and teams varying from year to year. The CONMEBOL Sudamericana is considered a merger of defunct tournaments such as the Copa CONMEBOL, Copa Mercosur, the winner of the Copa Sudamericana becomes eligible to play in the Recopa Sudamericana. They gain entry onto the next edition of the Copa Libertadores and they contest in the Supercopa Euroamericana and the Suruga Bank Championship. Argentine club Boca Juniors is the most successful club in the cup history, argentine clubs have accumulated the most victories with seven while containing the largest number of different winning teams, with a total of six clubs having won the title. The cup has been won by 11 different clubs and won consecutively once, in 1992, the Copa CONMEBOL was an international football tournament created for South American clubs that did not qualify for the Copa Libertadores and Supercopa Sudamericana. This tournament was discontinued in 1999 and replaced by the Copa Merconorte and these tournaments started in 1998 but were discontinued in 2001. In 2016, Brazilian team Chapecoense were travelling to the final when the plane carrying them crashed in Colombia, the opponents, Atlético Nacional, asked CONMEBOL to award the trophy to the Chapecoense. As of 2015 the tournament comprised 48 teams in a knockout format, the tournament shares its name with the trophy, called the Copa Sudamericana or simply la Sudamericana, which is awarded to the Copa Sudamericana winner. La Otra Mitad de La Gloria is a promotional Spanish phrase used in the context of winning or attempting on winning the Copa Sudamericana and it is a term widely used by Latin American media. The tournament itself has become highly regarded among its participants since its inception, in 2004, Ciencianos conquest of the trophy ignited a party across Peru. The Mexican football federation regards Pachucas victory in 2006 as the most important title won by any Mexican club, sports Illustrated qualified Arsenal, unlikely contenders for the 2007 edition, as the underdog that couldnt be stopped. Like the Copa Libertadores, the Copa Sudamericana was sponsored by a group of multinational corporations, like the premier South American club football tournament forementioned, the competition used a single, main sponsor. The first major sponsor was Nissan Motors, who signed an 8-year contract with CONMEBOL in 2003, the competition has had many secondary sponsors that invest in the tournament as well. Many of these sponsors are nationally based but have expanded to other nations, nike supplies the official match ball, as they do for all other CONMEBOL competitions. Embratel, a brand of Telmex, is the only sponsor of the tournament. The cup is one of several inter-South American club competitions that have been organised on the continent. The first competition was scheduled for the 1913 season and the last in 1955, the Copa Ricardo Aldao is seen today as the first stepping-stone into the creation of Copa Libertadores. In August 2015 a CONMEBOLs article described Aldao Cup as the first official international professional football cup in South America, friendly matches were common between clubs from Argentina and Uruguay in the early 1900s due to the close proximity of the nations. As such, the competition was named after his donation, the first edition, organized in 1913, was to be contested between Estudiantes from Argentina and River Plate from Uruguay. However, the match was suspended due to rain and never rescheduled. The first champion of the competition was not crowned until 1916, originally, a single-legged format was adopted, with the match played in Argentina and Uruguay in alternative year. But in 1940, Boca Juniors left the field when the match was at a draw of 2-2, the title was awarded to Nacional at first, yet on both associations did not defined clearly the champion of this year. These revolutions followed the American and French Revolutions, which had profound effects on the Spanish and French colonies in the Americas. Haiti, a French slave colony, was the first to follow the United States to independence, during the Haitian Revolution, from this emerged Napoleon Bonaparte as French ruler, whose armies set out to conquer Europe, including Spain and Portugal in 1808. 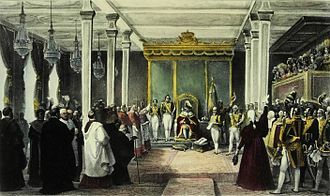 At the same time, the Portuguese monarchy relocated to Brazil during Portugals French occupation, after the royal court returned to Lisbon, the prince regent, remained in Brazil and in 1822 successfully declared himself emperor of a newly independent Brazil. This infuriated many colonists, and eventually became the spark that ignited the American Revolutionary War, initial fighting began in 1775 and lasted until October 1781, when with French aid under Lafayette defeated the British army. British General Cornwallis surrendered in Yorktown, the American colonists subsequently, coming after or later, founded a federated republican government grounded in Enlightenment thought. A wave of revolutions followed the conclusion of the American Revolution, the remaining portion of British North America remained loyal to the British crown. These changes were accompanied by violent turmoil, including executions and repression during the Reign of Terror and this pivotal point greatly disrupted the political stability of both Spain and its colonies. 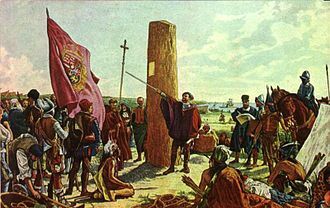 Cities throughout Spain and its colonies in America each formed governing bodies primarily consisting of local elites, the juntas swore loyalty to the captive Fernando VII and each ruled different and diverse parts of the colony. Most of Fernandos subjects were loyal to him in 1808, but after he was restored to the Spanish crown in 1814 and he abrogated the Cadiz Constitution of 1812 and persecuted anyone who had supported it. 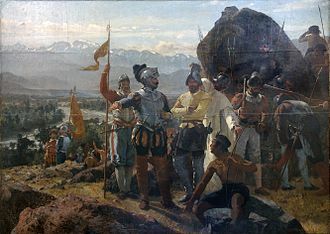 The violence used by royalist forces and the prospect of being ruled by Fernando shifted the majority of the colonist population in favor of separation from Spain, the royalists were the American and European supporters of King Ferdinand. 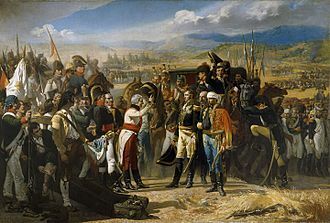 Americans and formed the royalist army, with Americans composing 9% of the royalist forces in all fronts, there were two types of units, the expeditionary units created in Spain and militias created in the Americas. The militias included some veteran units, only 11% of the personnel in the militias were European or American whites. After Rafael del Riegos revolution, in 1820, no more Spanish soldiers were sent to the wars in the Americas. 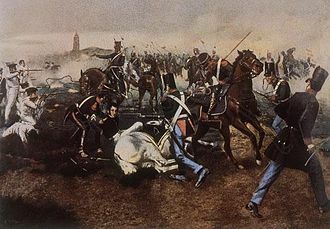 In 1820 there were only 10,001 Spanish soldiers in the Americas, and Spaniards formed only 10% of all the royalist armies, by the Battle of Ayacucho in 1824, less than 1% of the soldiers were European. 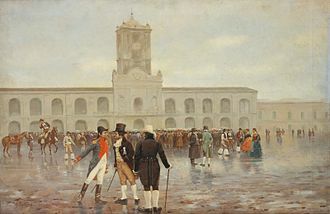 The Enlightenment spurred the desire for social and economic reform to spread throughout Latin America, ideas about free trade and physiocratic economics were raised by the Enlightenment. Independence movements in South America can be traced back to slave revolts in plantations in the northern-most part of the continent, in 1791, a massive slave revolt sparked a general insurrection against the plantation system and French colonial power. 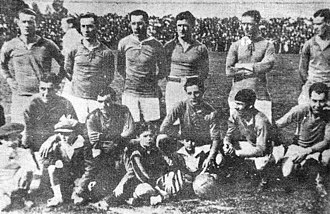 Independiente in 1922, that year the team won its first title. In 1926 the club won its second title in Primera. The first stadium of the club, 1922. 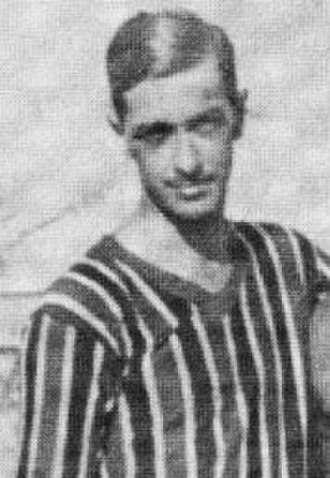 In 1918, the club won its first domestic title under the name "Club Atlético Peñarol"
La Mañana de Asencio, portrait by Carlos María Herrera about the cry of Asencio. Portrait of the Oriental exodus. Artigas Mausoleum at Plaza Independencia in Montevideo. The old Boca Juniors stadium in Brandsen and Del Crucero, where Boca Juniors played from 1924 to 1938. Placque donated by San Lorenzo de Almagro on the occasion of the inauguration of La Bombonera, May 1940. La Bombonera during a night game v. Colo Colo, with the refurbished boxes at right, March 2008. Panoramic view of Estadio Alberto J. Armando, mostly known as La Bombonera, taken in 2012. Nacional in 1905. That squad won the Copa de Honor Cousenier defeating legendary Argentine team Alumni. Nacional in 1915, posing with the three trophies won that year: Tie Cup, Primera División and Copa de Honor Cousenier. Nacional in Paris, during the 1925 tour on Europe. Nacional in 1934, when winning the Torneo Competencia. Rio de Janeiro saw the birth for the idea of the competition. Buenos Aires was the birthplace of the tournament during the 24th South American congress. 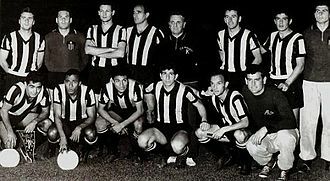 The Peñarol team that became the first ever champions of the competition. 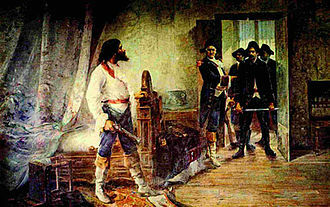 The Guayaquil conference (1822) between Simón Bolívar and José de San Martín, the greatest libertadores (liberators) of Spanish America. The first recorded photo of Boca Juniors taken in 1906, after winning the Copa Reformista. Some jerseys exhibited at "The Passion for Boca Juniors Museum". The first jerseys used by the team in the 1900s. Estadio Monumental after its expansion completed in 2009. 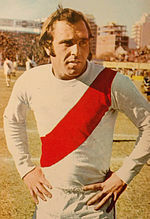 Telê Santana is one of four managers to win two record Recopa Sudamericana medals, and the first to earn them consecutively. 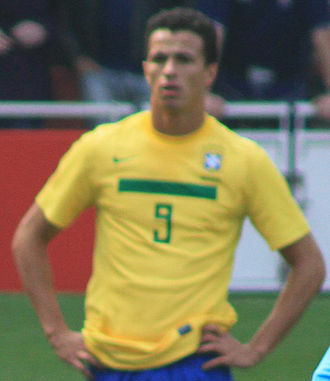 Leandro Damião, as well as Rodrigo Palacio, is joint record holder of most goals scored in a season with three goals. Fox Sports logo, used from 2009 to 2012. Former logo of Fox Sports 2.